ATTENTION MAC USERS: If you experiance issues with the installer please e-mail me (ross.korsky@gmail.com) and I will provide a workaround. Autodesk makes the installers and they are aware of the issued. That said, the Mac installer has been broken for quite some time and I have little confidance that it will be fixed any time soon! Helical gears resemble spur gears with the teeth at an angle. They can be meshed in parallel or crossed orientations at 90 degrees or arbitrary angles and can be generated with as little as a single tooth forming a screw gear. Gears may be specified in either the 'Normal' or the 'Radial' system or the fixed profile Sunderland standard, any of which can be generated as either Left or Right handed. 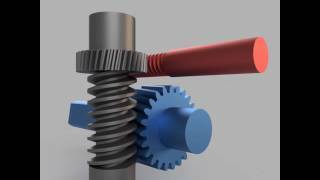 Handedness in helical gears refers to the direction the teeth lean when the gear is placed flat on a table. 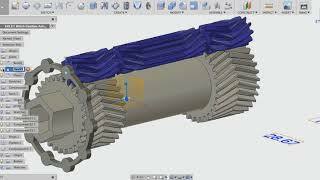 Using this add-in, proper Herringbone gears (such as the gears used for this add-in's thumbnail) can be created by using a Sunderland profile then mirroring the gear about one of its faces. In the case of Herringbone or other double-helix gears the handedness of the base gear is not as significant as it is for single helix gears - to effectively change the handedness of a Herringbone / double helix gear all you need to do is flip it over - whereas for a single helix gear it must be mirrored to change its handedness. Finally, by setting a helix angle of 0 degrees, Spur gears can be created and defined in the metric system (as opposed to the sample Spur Gear script which defines gears in the American system) with this add-in. 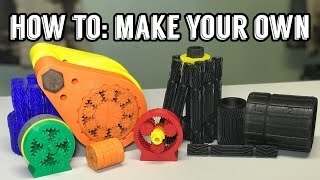 Be sure to check out the Gear Down For What YouTube channel and on thingiverse - he is doing some amazing things with Helical Gears! Installer worked for MacOS without a problem. Simple to use. Works great. The installer still does not work for MacOS, but Ross was kind to provide a usable package by e-mail. The addon works great! Really easy to use and results are perfect. Can this also be used to generate the gear for the inside of a ring and not just the outside? Parameters are well documented and the resulting gears mesh nicely. Haven't been able to use it since it consistently crashes Fusion 360. Be nice to select either metric or inch for the units. Or have it use the default units for each design. Not everyone uses metric. Easy to use and the results are fantastic! !